Twenty-one patent filings, along with other documents reviewed by TYT, show that FedEx and UPS are actively investing in drones and driverless vehicles—which some analysts estimate could cost thousands of jobs—even as both companies lobby for corporate tax cuts they say will create jobs. One official involved in research for FedEx told TYT that the industry is looking at drones for more than just deliveries to unusual locales, but as a future “staple” of urban delivery, as well. TYT previously reported that the two companies—among the nation’s biggest employers—are spending hundreds of millions of dollars on automating their package scanning and processing capabilities, and investing in research to create new automation technology. Both UPS CEO David Abney and FedEx CEO Fred Smith have said publicly that corporate tax cuts will lead generally to economic growth or, specifically, will create jobs. As TYT reported, the two companies have both lobbied Washington lawmakers for tax cuts and support several business organizations actively pushing for tax cuts. Recent financial filings from the two companies, however, reveal no plans to use any tax windfall for wholesale new hiring. Instead, corporate and academic documents, as well as public statements from executives at both FedEx and UPS, suggest it’s more likely a tax windfall would contribute to ongoing investments in drone technology that could reduce long-term headcounts. FedEx has created an entire academic institute at a public university in its home state that now has a research cluster devoted to drones. FedEx established the FedEx Institute of Technology at the University of Memphis in 2003. At the launch ceremony for the Institute, Smith commented on how the Institute relates to his company. In 2016, the Institute created a drones research cluster, including autonomous vehicles under its umbrella. The Institute refers to the cluster’s research as the DRONES initiative, for Drones, Robotics and Navigation Enabled Systems. FedEx has invested at least $10 million in the Institute since its founding in 2003, including $5 million in seed funding. According to the Memphis Business Journal, the Institute also received $15 million in initial funding from the Tennessee Board of Regents, $2 million from the City of Memphis, and $1 million from Shelby County in Tennessee. Since its creation in 2003, the Institute says in its most recent annual report, its researchers have disclosed 170 inventions and received eight copyrights, 34 U.S. patents, and 15 licenses to industry. Cody Behles, manager of innovation & research support for the FedEx Institute, told TYT that he believes drones will play an increasingly prominent role in the shipping and logistics industry for companies such as FedEx and UPS. Earlier this year, the MIT Technology Review reported that FedEx Chief Information Officer Rob Carter said his company is “very much interested in” achieving completely autonomous trucking. The company has deployed its own internal researchers to work on autonomous vehicles-related patents. UPS is already testing delivery drones. In February, it announced the successful test run of a package delivery via a drone launched from the top of a delivery truck. UPS told reporters that it sees the delivery as a bellwether for the future. 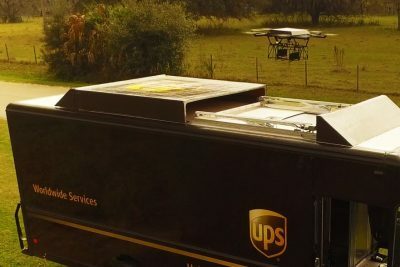 The test was neither UPS’s first drone test, nor its first collaboration with other companies specializing in drone technology. In 2015, CyPhy Works announced $22 million in new funding, including an undisclosed amount from the UPS Strategic Enterprise Fund. Just under a year later, UPS announced its first tests of CyPhy drones to make deliveries to remote and hard-to-reach locations. “Our focus is on real-world applications that benefit our customers,” Wallace said. UPS is also an investor in Peloton Technology, which includes John Formisano—former vice president of global vehicle operations for FedEx Express—on its advisory board. Peloton is researching driverless vehicles. Both FedEx and UPS are also working within government to clear regulatory barriers against driverless vehicles and drones. FedEx Corporate Vice President of Operations & Service Support Gloria Boyland serves on the DOT’s Federal Committee on Automation, formed by the Obama Administration, though the committee has yet to hold a meeting since Donald Trump assumed the presidency. The committee was created to advise on proposed regulations for autonomous vehicles, but the DOT reportedly plans to move forward with its own regulation announcements as early as this fall. Houston Mills, UPS Airlines’ director of safety, sits on the Federal Aviation Administration’s Drone Advisory Committee, also originally put together by the Obama Administration. Neither company responded to multiple requests for comment about how their drone and automation efforts might affect future job numbers. UPS referred TYT to CEO David Abney’s September statement supporting the Republican tax-reform outline. In a May report, Goldman Sachs concluded that driverless vehicles could cost the U.S. economy 25,000 jobs per month. Featured image is from ups.org.